California consumes more petrol than India! Well, brought to our attention by Wired, recent empirical data rubbish this argument and kick it to the curb. (PDF file) The state of California's own statistics show that, in 2006, the state consumed 20 billion gallons of diesel and petrol as transportation fuel, a more than 50 per cent increase over the past two decades. But even more interestingly, 20 billion gallons a year tops the transportation fuel usage of the entire nations of China or India! Chew on that for a while, and allow it to truly sink in: California alone uses more petrol and diesel for fuel that any other country in the world, save the United States as a whole, which used a whopping 136 billion gallons, or 44% of the world's transportation fuel consumption. Of course, listening to US politicians, talking heads and media reports, one wouldn't know it. They constantly inundate us with stories of India and China and their rapid growth, and what it portends for the developed world. The two emerging Asian giants have been blamed for everything from food shortages to rising fuel prices to global warming. But instead of worrying why Indians need two rotis per day rather than one, or why our rapid development has led to increased vehicles on India's roads, perhaps it's time for America to do some soul searching and ask a few questions of itself. Isn't it outrageous for a state with 36 million people to consume more transportation fuel than a nation of 1 billion, India, and still point the blame elsewhere? The second question, how is this even possible? How can every 1 Californian consume more transportation fuel than 30 Indians? It's simple, really. In Asia, we utilise compressed natural gas, mass transportation, bicycles and our good old fashioned leather chappals to get around. In California, it's not unusual for a family of four to have four vehicles, and for each member to drive his or her own separate way, every day! Whereas the Indian railway system is the world's envy for its efficacy and efficiency, trains are a thing of the past in the States, more of a novelty than anything else. Buses are used only as a last resort, and metros, subways and other urban forms of mass commute are practically non-existent in the Golden State, save San Francisco's iconic streetcars. And even those are primarily tourist attractions. The average American's idea of 'public transportation' is sharing a taxi. Compare this with Mumbai, where an estimated 6 million people avail of the local trains each day, cramming one on top of another into packed compartments. Now, the discrepancy starts to make sense. So next time you read of an environmentally conscious American preaching about India's lack of a commitment to green-friendly practices, chances are, that the American is alone in his sports car, cruising the highways around Los Angeles, with the air conditioning on high. Then, picture that packed Virar-Churchgate local in Mumbai. Text: Matthew Schneeberger. 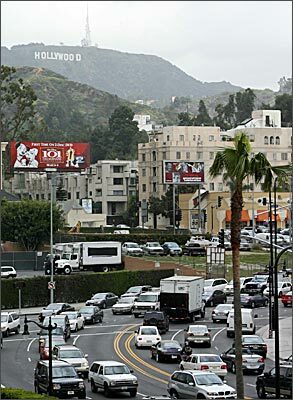 In this photograph: Traffic in Los Angeles, California. Photograph: Gabriel Bouys/AFP/Getty Images.